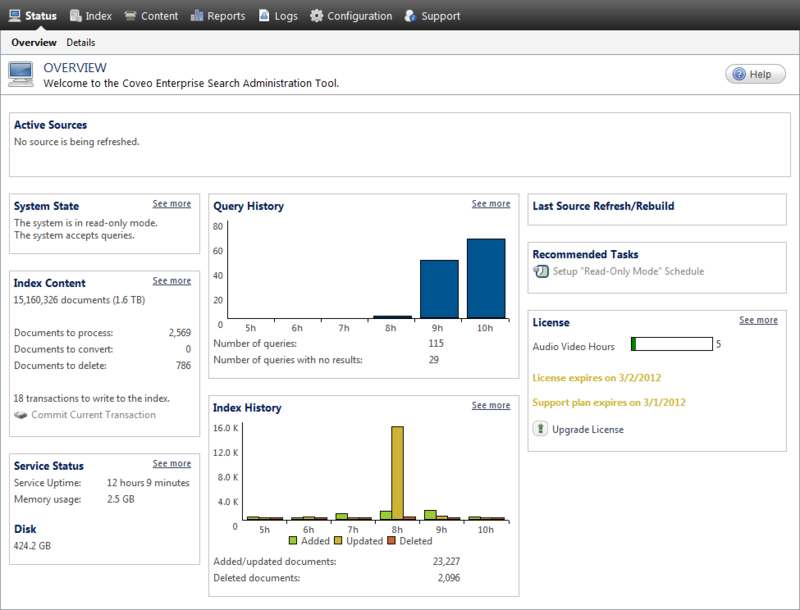 The Coveo administrator uses the Administration Tool to configure all the Coveo Enterprise Search (CES) processes, except for the search interfaces—which are configured through the Interface Editor. The Administration Tool is a web application that runs from each Coveo server (see Opening the Administration Tool). Note: The user interface of the Administration Tool is available in English and French. When you are in the Administration Tool, you can easily switch from one language to another by pressing the Ctrl+Alt+Page Up keyboard shortcut keys or using an Advanced menu parameter (see Modifying Advanced CES Parameters). The Administration Tool is organized into eight tabs (see Navigating in the Administration Tool). The following table briefly describes the content of each tab. Status Displays information about past and current CES processes (see Administration Tool - Status Tab). Index Allows Coveo administrator to populate the index with collections and sources, fine-tune ranking, create a thesaurus, configure mirrors and slices, and enable result clustering (see Administration Tool - Index Tab). Content Displays the content of the index and allows users to test the search function (see Administration Tool - Content Tab). Reports Displays charts and statistics concerning the querying process, indexing process, and index content (see Administration Tool - Reports Tab). Logs Displays detailed information about the system and the querying and indexing processes (see Administration Tool - Logs Tab). Configuration Allows Coveo administrator to configure the CES security parameters, create schedules, manage connectors and converters, describe the structure of documents, enter new license codes, and set system alerts by email (see Administration Tool - Configuration Tab). Support Provides links to different support resources.